Pictured (left to right) at the Mobile Industry Awards are: Mark Fermor, Mobile Business Development Director at Future Publishing; Aaron Brown, COO of Onecom; Darren Ridge, CEO of Onecom, and former England rugby player Martin Bayfield, who hosted the ceremony. Business communications specialist Onecom is celebrating a major national industry award which confirms its position as the leading unified comms provider in the UK. 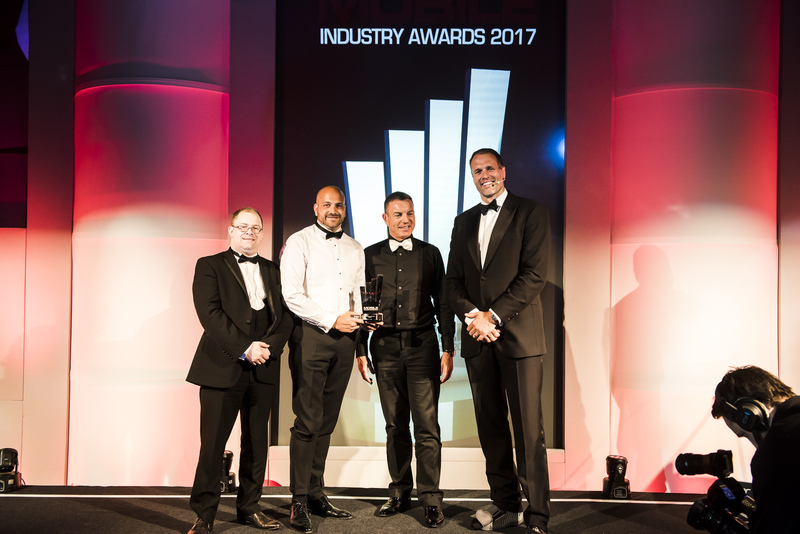 The company took the title of Best Unified Comms Dealer at the Mobile Industry Awards (MIAs), which were handed out at a high-profile industry event at The Brewery in Central London. The awards, run by Mobile Today, are recognised as a leading national event in the mobile industry calendar and are attended by top international companies and UK firms. The award recognises Onecom’s expertise in bringing mobile, landline and internet services together in one package for businesses, and puts the company alongside household names including Carphone Warehouse, Vodafone and Samsung as winners of an MIA this year. Onecom’s entry focused on the company’s strong customer relationships, technical innovation, financial growth, staff training and development and its integrated business communications offering through mobile, fixed line and internet services. Darren Ridge said: “This award represents national recognition for Onecom as the provider to beat when it comes to integrated business communications solutions. The Mobile Industry Award sits alongside Onecom’s current title as Vodafone’s Total Communications Partner, which is the network’s highest accolade and is also awarded for excellence in unified communications. Onecom is also shortlisted for Customer Service Team of the Year in the forthcoming Comms Business Awards, a Workplace Wellbeing Award in Northern Ireland and in the Solent Deals Awards for its multi-million-pound acquisition of Evolve Telecom in 2016. Onecom, based in Whiteley, Hampshire, maintains 12 regional offices, including London, Cardiff, Southampton, Plymouth, Leeds, Telford, Norwich, Belfast and Brighton. It currently manages over 325,000 mobile connections, delivering communication services and unified solutions across fixed line voice, connectivity and cloud computing to some of the UK’s most dynamic companies.